All transactions are safe and secure with a reliable history in online purchasing behind each of our associates. 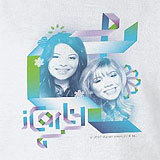 Buy the Carly and Sam t-shirt to own iCarly clothing and merchandise. Although all of our iCarly tees are too cute to resist, some of you might not be into all the pinks and purples featured on many of the designs. For those people, we have this adorable blue hued Sam and Carly shirt. The colors are just as fun and vibrant but a little more on Sam's style side. You can check out Carly and Sam's fashion sense on iCarly DVDs while you catch up on missed episodes. In addition to the Carly and Sam tee above, browse the iCarly Clothing Gallery for more apparel like men's and women's clothes, kids shirts or hoodies.